7 residents of Bedouin town Rahat in Negev found while digging up coins from 2,000 years ago and causing irreversible damage. Seven residents of Rahat, a Bedouin Arab town in the Negev, were caught on Wednesday night stealing antiquities from the archaeological site Tel Ma'aravim adjacent to Rahat. The seven, all aged in their thirties, were caught in the act as they dug at the site looking for ancient artifacts, all while causing irreversible damage to the layers of archaeological evidence. Border Patrol officers and the Israel Antiquities Authority captured the seven in a joint operation. The Arab criminals were stealing ancient coins from the time of the Roman occupation of Israel 2,000 years ago, which ended the second Jewish kingdom in Israel. Several of the antiquities thieves were found on the site trying to dig up antiquities, while others were several hundred meters away standing guard and trying to prevent anyone from interfering. After a short ambush the officers arrested the group of thieves. Those at the site were nabbed immediately, while those standing guard tried to flee before being chased down by the officers. 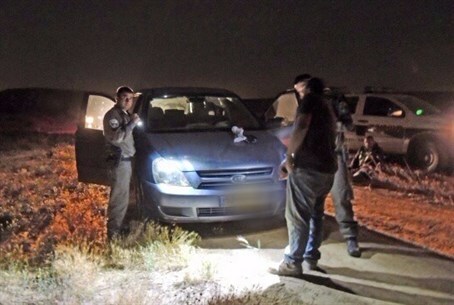 "The fighters acted firmly and professionally as in every mission they receive; this isn't the first time we are conducting an arrest of antiquities diggers," said superintendent Ovdi Malichi, commander of the rural region of the Negev. Malichi added, "fortunately this evening it can be said that a cell that was seriously engaged in the field (of antiquities theft) was caught." The suspects were caught while in possession of digging tools and a metal detector. A search of their cars found ancient coins from the Roman and Byzantine periods.